It was the ninth year of the Fourth Turning. The Great Depression was still in progress. After a few years of a faux recovery (stock market up 400% from the 1932 low to its 1937 high) for the few, with the majority still suffering, another violent leg down struck in 1938. GDP collapsed, unemployment spiked back towards 20%, and the stock market crashed by 50%. The hodgepodge of New Deal make work programs and Federal Reserve machinations failed miserably to lift the country out of its doldrums. Sound familiar? The average American household had not seen their lives improve and now the foreboding threat of war hung over their heads. 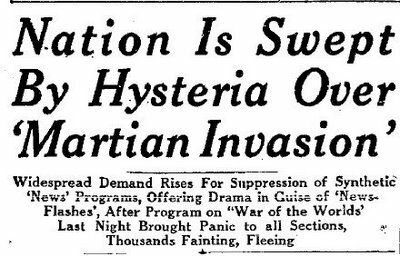 Studies discovered that fewer than one-third of frightened listeners understood the invaders to be aliens; most thought they were listening to reports of a German invasion or a natural catastrophe. The public allowed their emotions to overcome their rational mind. Playing upon people’s fears becomes easier when they are emotionally susceptible and beaten down from years of bad news. Even though it was specifically stated the show was a work of fiction, the mental state of the country was so panicked, people believed something bad was on the verge of happening and allowed themselves to believe. Much of the credit for the realism of the broadcast goes to Welles, a brilliant showman, who went on to create one of the greatest movies ever made just three years later – Citizen Kane. Welles thought the script was dull, just a day or two before the broadcast. He stressed the importance of inserting news flashes and eyewitness accounts into the script to create a sense of urgency and excitement. The nation had gotten used to breaking news bulletins during the Munich Crisis. Another important issue was the fact the Mercury Theater on the Air was a radio show without commercial interruptions, adding to the program’s realism. The entire episode lasted 90 minutes and at the end of the play Welles assumed his role as host and told listeners the broadcast was a Halloween concoction: the equivalent, he said, “of dressing up in a sheet, jumping out of a bush and saying, ‘Boo! '” Despite the announcements before and after the show, the outrage and calls for Orson Welles’ head were deafening. What struck me while watching the PBS retrospective were the similarities between then and now. The gullibility of the masses, the power of fear, the overreaction by the media, busy bodies calling for the government to do something, and the effectiveness of propaganda are all commonalities between that Fourth Turning and today’s Fourth Turning. Evidently some listeners heard only a portion of the broadcast because they had been tuned into the Edgar Bergen Show and switched to CBS radio after the play had begun. Some of these people were overcome with fear as the tension and anxiety prior to World War II led them to mistake it for a genuine news broadcast. Thousands of those people rushed to share the false reports with others, or called CBS, newspapers, or the police to ask if the broadcast was real. The telephone switchboards were overcome with volume and policeman overstepped their authority and entered the CBS studios to try and stop the show mid-broadcast. Evidently, the authorities weren’t big fans of the First Amendment or Fourth Amendment in 1938 either. Retrospective analysis has found the hysteria was not as widespread as purported by the mainstream media. The fact the play was performed in NYC, the media capital of the world, and the fictional attack was occurring in New Jersey provided much more publicity to the event. In reality, most of the dupes who were gullible enough to believe that Martians were actually attacking were old people and women. The timeline of the show should have revealed its falsehood to any critical thinking person, as the military somehow was mobilized and defeated within a 30 minute window. It seems our society will always have a large swath of people who will believe anything they are told by the media or the government. Our government run public education system now matriculates millions of functionally illiterate zombie like creatures into society, who can be easily manipulated and controlled through the use of mass media and false propaganda. Those who constitute the invisible government behind the Deep State duly noted the psychological power of fear during this episode in history. The master of propaganda during that age even noted the impact on the American public. Adolf Hitler referenced the broadcast in a speech in Munich on November 8, 1938. Welles later remarked that Hitler cited the effect of the broadcast on the American public as evidence of “the corrupt condition and decadent state of affairs in democracy”. It likely confirmed his belief the democratic countries of the world would not have the guts to stand up to a man willing to wage all out war. He invaded Poland less than one year later, initiating the bloodiest war in history. 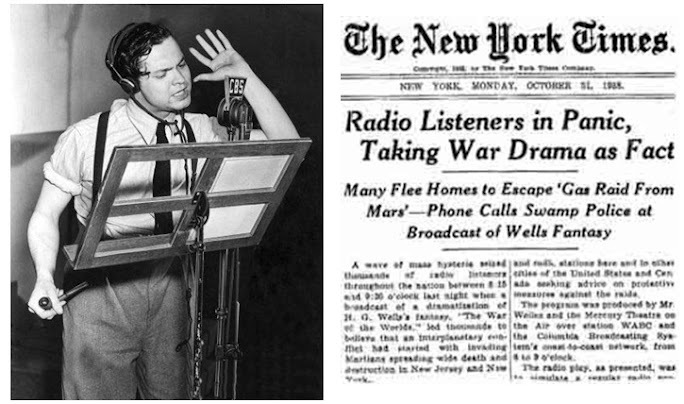 As I watched the despicable display of yellow journalism by the pathetic excuses for journalists during the CNBC presidential debate the other night, I was reminded of the PBS show and how the press completely blew the War of the Worlds broadcast out of proportion to its actual impact. Within three weeks, newspapers had published at least 12,500 articles about the broadcast and its impact, although the story dropped off the front pages after a few days. It was essentially a tempest in a teapot that has lived on for decades because the press created the outrage and fear. This is no different than what happens on a daily and weekly basis today. The mainstream media attempts to work the masses into a frenzy over a meaningless debt ceiling “showdown”, the latest hurricane or snowstorm, the latest fake terrorist warning, the collapse of Greece, the imminent acquisition of a nuclear bomb by Iran, the invasion of the Ukraine by Russia, or whatever sensationalist storyline that will get them ratings and strike the necessary fear into the hearts of the masses. Every looming threat is relegated to the back pages of the legacy media rags a few days later. The degraded faux journalists prefer to distract the willfully ignorant masses with the latest Kardashian/Lamar Odom/Caitlyn Jenner reality TV episode, Oscar fashion shows, professional sports, how to get rich in the stock market infomercials, and how you can have the perfect body segments on one of the dozens of faux news shows. What I found fascinating in the PBS episode is the never ending calls from busy bodies, control freaks, and lovers of government coercion to do something about everything they don’t like. In the days following the broadcast, there was widespread outrage in the media. The program’s news-bulletin format was described as deceptive by some newspapers and public figures, leading to an outcry against the perpetrators of the broadcast and calls for regulation by the Federal Communications Commission. How dare Orson Welles broadcast a play, described beforehand as a work of fiction, in a creative, exciting, and realistic manner. Do you see any similarities to calls for the FCC to control the internet, where anti-establishment websites dare to speak the truth? There will always be a sociopathic segment of the population who want control over everything and everyone. They want bigger government, more laws, more regulations, more restrictions, more taxes and more control over your life. The 1930’s marked a huge turning point for this country, with the majority supporting the New Deal and government intervening deeply into our everyday lives. Today, the government, in the control of bankers, crony corporate interests, billionaires, and captured political hacks, has smothered our freedoms, liberties, entrepreneurial spirit, intellectual debate, and ability to change the system from within. Shortly after the Welles broadcast, the nation came together and endured seven years of shared sacrifice, with the young men of the country fighting and dying on continents and islands far from our shores in a struggle against aggression. Today, I feel the aggression is coming from within. It’s our own government and the men who control it who are the real enemy. The coming struggle during this Fourth Turning is more likely to be American versus American. A prominent figure from the last Fourth Turning saw into the future decades ago, and he was right.